Fitness Reality 2000 Super Max XL is an 850 lb. weight capacity solid, durable, reliable functional and adjustable weight bench with a heavy-duty steel frame to offer a great platform for working out and performing a variety of exercises with free weights and body weight. Fitness Reality 2000 is a hot new release one of the better selling weight benches that score 4.4 out of 5 stars at the time of this review. It is currently shipped within a couple of days of your order via Amazon.com and will be shipped mostly assembled to you. The heavy-duty construction is because of the steel frame that measures 2 x 3 inches and the great quality components. It supports people that are up to 6’4” tall and a total user plus weights capacity of 850 pounds. It comes with a removable leg lock-down with four foam rollers with 4” diameters so your feet can stay in place during your workout session. The two-inch thick backrest and foam seat that is covered by soft and durable dual stitched vinyl ensure you stay comfortable over long sessions. The bench is 18.3 inches high when in the flat position and both the seat and the 37-inch extended backrest are adjustable independently to different angles. You’ll see clear labels that let you choose the angle you want easily. The backrest can be adjusted to seven levels between -15 and 85 degrees smoothly and the seat can be set to 0, 8 and 15-degree angles. 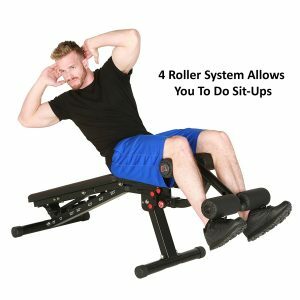 The leg lockdown with 4 foam rollers will ensure you do your decline bench presses and sit-ups safely. You can adjust the front rollers to three different positions. And the leg lock-down will stay in place firmly with the twist-locking pin. Although the seat and the backrest are separate the distance between them is eliminated at whatever angle you’re using both, with the patent-pending seat design. The two different backrest widths are offered during the assembly process as you can simply flip the back for a wider support if you’re a bigger person. You can do more than twenty workouts for your chest, shoulders, arms- biceps and triceps, back and abdominals, including dips, crunches, sit-ups, dumbbell curls, dumbbell rows, shoulder presses, chest presses, lying tricep extensions and more. Fitness Reality 2000 XL weighs 65 pounds and measures 69. 5 x 24 x 52 inches as assembled. It has a foldable design, measures 53.5 x 24 x 10.8 inches as folded, and includes transportation wheels for you to move it effortlessly. You can use this weight bench with any of the Fitness Reality Power Cages. And it can be used every day easily by members of your house as it is quite durable with a commercial grade equipment. It is a very robust weight bench with a heavy-duty steel frame, is very reliable and ruble, has a smart ergonomic design, is very comfortable to work out on and functional with different angles on the backrest and the seat and the gap between, is conveniently foldable. It is great value for money and easily competes with the much higher priced weight benches on the market. There is a phone number on the box for the Customer service and they respond very quickly and are helpful whenever you may have any issues or need assistance. They’ll be happy to replace the defective parts within the warranty period.